Out of Home is a one to many medium, continuing to deliver for advertisers through the use of iconic sites enabling big brand messaging at scale. What’s exciting, is not only is the medium the most effective at delivering the big message; enhanced inventory, technology and creativity are enhancing the ability for OOH to be a true activation medium. IPA studies have shown OOH drives online traffic cost-effectively while also building and strengthening brands when used as a lead medium. Out of home is an unblockable, unskippable medium that delivers scale, can sell products and create brand fame. Yet it causes little disruption to audiences: it is non-interruptive; it doesn’t use your data allowance or deplete your battery life; and it gathers little if any of your personal data. In an increasingly fragmented media landscape it is the purest broadcast medium that can quite literally stop people in their tracks. High-definition digital screens and data-driven dynamic content now provide even more creative potential and measurable effectiveness than ever before. Out of Home is always on, no clutter, no filter, no off switch. Pure advertising. Broad reach with consistent messaging drives long term growth. 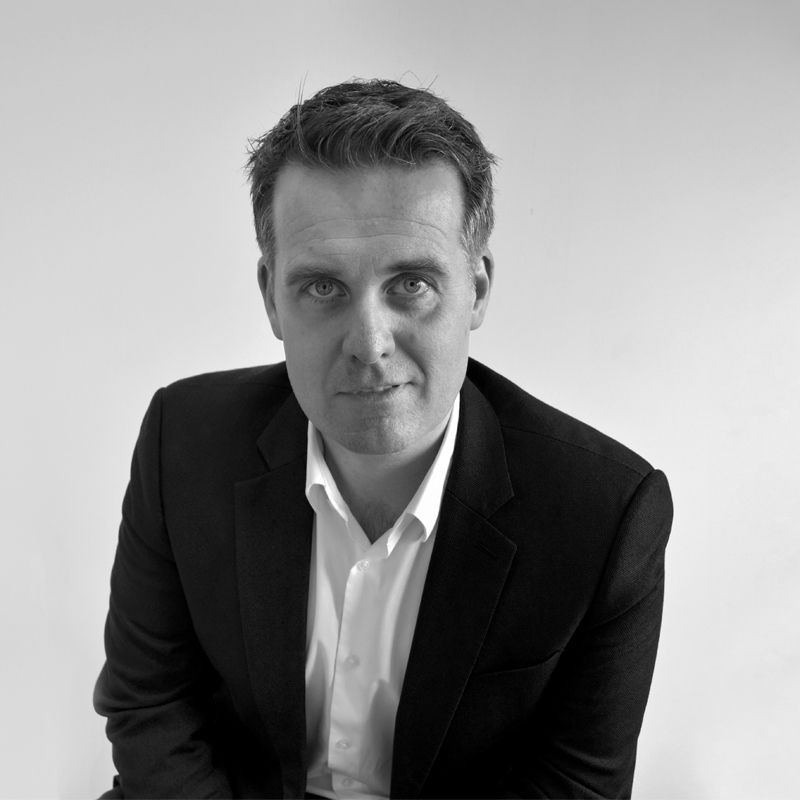 Sophisticated mass marketing as advocated by many academics including Byron Sharp enables penetration by understanding the heterogeneity in your market, and then catering for only the differences that matter in order to maximise reach and mental availability while not eliminating the benefits of scale. Balancing short and long-term marketing is a challenge for modern marketers. The 60/40 split between brand and activation as advocated by Les Binet and Peter Field in their seminal work ‘The Long and the Short of it’ emphasises brand strategies driving long-term success, in which OOH is a central component. Through investment in research, technology and an unrelenting focus on data led planning, we understand even more about how people live, work and play. We have developed research systems and tools to make strong media recommendations, grounded in data, to help advertisers quantify their marketing investment. The Locomizer platform for example, adds to our ability to provide clients with new levels of targeting matching audiences and locations via mobile data. OCS, our proprietary Out of Home Consumer Survey is an integral part of our planning process that enables our teams to efficiently and effectively identify the behaviours and attitudes of consumers and translate these into actionable insights. Furthermore, our Pinpoint mapping supplemented by Census data enables location and demographic specific site selection while our partnership with Locomizer enables targeting using mobile data. These insights and tools overlayed with the industry measure JNOR are used to inform the most appropriate and accurate OOH plan for our clients. 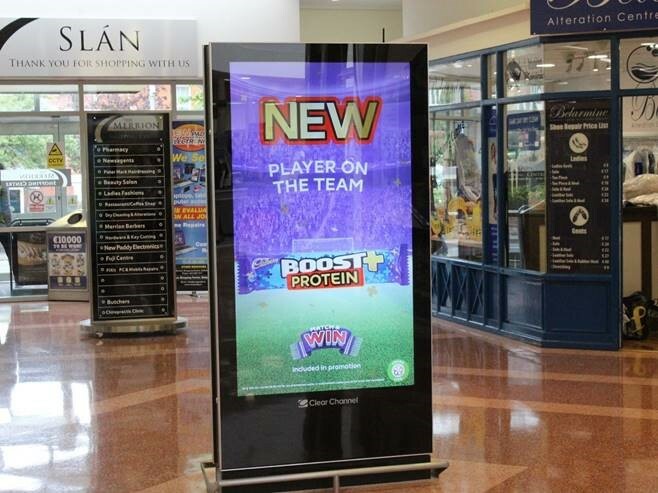 Activation / Site selection for the launch Cadbury Boost Protein was informed by Locomizer through identifying sports and fitness affinity groups by location, based the places where they spend their time and post tweets related to the topic. Out of Home engages people as they live, work and play. No matter the time of day or day of week, there are Out of Home solutions that can engage with consumers as they go about their daily lives. The Smirnoff Pride Luas tram exemplifies how brave, bold and clever creative can make the medium the message. Clients are strategically using classic formats which deliver on the fundamental strengths of the medium – impact, coverage and awareness in combination with the flexibility in content and scheduling offered by digital. Flexible ways of serving campaigns means multiple messages highly relevant by location are more prevalent as can be seen for Cadbury’s current activation encompassing Premier League scores. As the last window of influence, Outdoor can engage people with a relevant message in the right context, to influence a purchase. An enticing feature of Digital Out of Home is that it offers the ability to trigger creative content based on a variety of data streams. Our Dynamic platform delivers tailored content and deepens the relevance of the messaging to the audience. It enables contextual digital campaigns to run seamlessly across multiple networks at scale. Our immediate location determines a remarkable amount of our decisions and contextual messaging can tap into this. 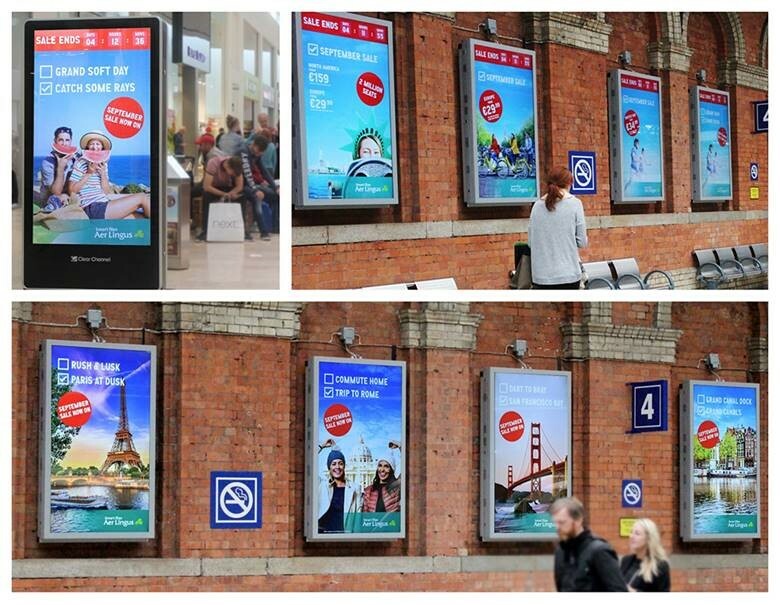 Activation / Aer Lingus has announced its Winter sale through a contextual OOH campaign incorporating 48 Sheets alongside dynamic digital screens, the multi-content campaign seeks to highlight its range of winter breaks and earn front of mind awareness. Weather – live weather data triggers a creative change in that once it’s starts raining new taglines ‘Grand Soft Day’ & ‘Lashin Rain’ appear. Countdown – A live countdown kicks in during the final days of the sale to remind prospective holidaymakers of when the great prices end. Our OCS travel and consumer survey indicates that over a third of workers think about holidays when commuting while over a quarter of adults do the same when out for shopping or leisure at weekends. 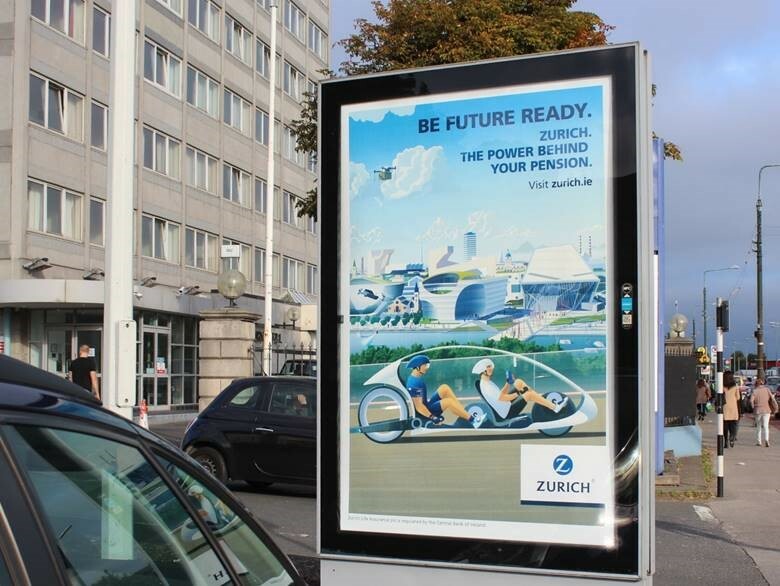 Brands are increasingly utilising OOH for experiential activations. A “show don’t tell” strategy adds depth to traditional messaging furthering brand connections and driving social amplification. In the new world of content, we recognise the potential that OOH provides for clients to create content solutions for their brands that can move consumers and create engagement. Often, this involves creating a new media solution or bespoke activation. 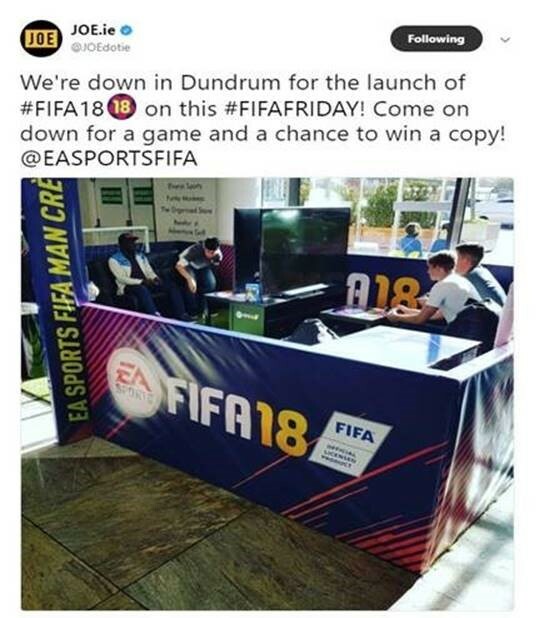 Activation / To celebrate of the launch of FIFA 18, EA Sports activated an experiential marketing event to surprise the unsuspecting shoppers of Dundrum Town Centre. Over one weekend, shoppers could avail of EA Sports impressive FIFA 18 ‘man crèche’, an area to kick back and relax and get stuck in to sampling the legendary game. Out of Home’s unique mix of scale, location and canvass offers massive potential to create impact via iconic, memorable creative. Creativity trumps everything and it’s business critical. Our iQ data that spans over 17,000 Out of Home campaigns tells us that higher levels of design ratings impact on recall. A study by Data2Decisions found that creative execution is the second most significant factor impacting advertising profitability and return on investment. It found creative execution has a profit multiplier of 12, which means ‘effective’ creative could deliver an ROI 12X than that of ineffective creative. It is second only to brand size, which is largely out of a marketer’s control. Our iQ databank confirms that OOH with a strong single message, high levels of colour and contrast and strong imagery are rated higher by consumers and in turn generate higher levels of recall, understanding and purchase consideration. Creative pre-testing through our Heat Mapping is being used more and more to optimise poster designs by our clients and we encourage it on every piece of artwork. Activation / It was great to see Nissan pick up the Grand Prix at the recent ADFX Awards for the launch of the new Micra. 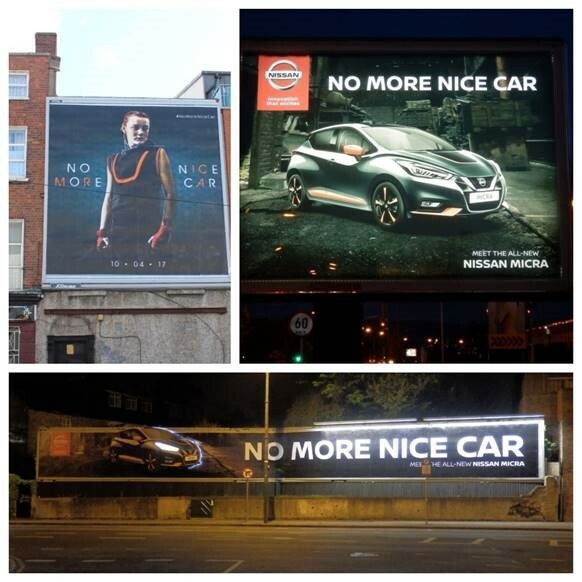 The campaign which was built on a bold creative platform had OOH front and centre with a 30% share – three times that allocated in other markets. A teaser campaign incited curiosity and conversation around the launch while launch phase introduced iconic sites and special builds. The Outdoor audience is mobile, digital, young, affluent, urban and high-spending, an attractive market for brands. 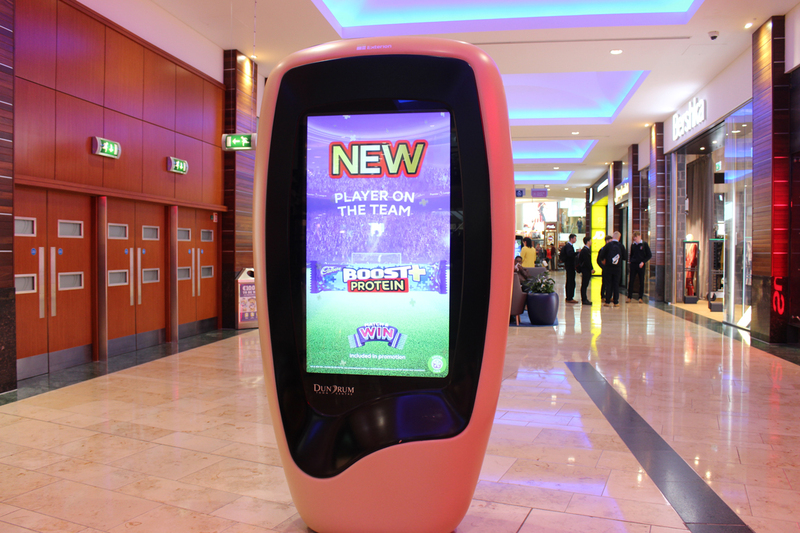 OOH is also the perfect fit for TV viewers, radio listeners and news media readers. The medium perfectly amplifies broadcast campaigns into a single frame poster which augments TV campaigns street side. Out of home and radio can also be an effective audio / visual combination especially amplifying targeting of commuters. Together they generate higher levels of frequency, delivering multiple executions to consumers operating in different mindsets. Cinema and OOH are natural bedfellows whether it be film launches on T-Sides or in-foyer screen advertising targeting specific demographics in a relaxed mindframe. Integration of mobile and Out of Home is inevitable as people are becoming more and more digitally connected to information, entertainment and each other. Since people are constantly on the go, much of this occurs out of the home. Outdoor and mobile are naturally complementary media, given the environments in which they are consumed and the ability of Out of Home to act as an online driver. According to a recent study from Nielsen and the Outdoor Advertising Association of America (OAAA) OOH ads are just as likely as TV – if not more so – to prompt social media activity is the most cost effective medium in doing so. Out of Home truly is the most powerful advertising platform and it is now living up to its promise of delivering sophisticated mass marketing for brands. As with any performance, understanding your crowd and wowing them with creativity and perfection in execution will always win out. So for now and beyond, the stage is set, let’s lift the curtain – it’s showtime!